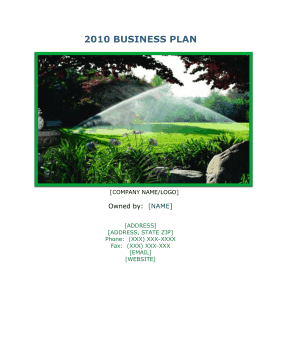 This free, printable business plan can help landscapers, contractors, and gardeners expand revenue when providing irrigation services. [COMPANY NAME] has been in business since 1989, serving a core customer base of Landscape Contractors, gardeners, cities, school districts, counties and states agencies. We will be expanding products with a new division of our company to offer a whole line of gas powered equipment and service specifically for our industry and in which our current customers use from day to day. Our projected sales for this new venture should be approximately $550,000 to $600,000 the first year with a gross profit of 25% or more. Our new location has high visibility and easy access for our customers. The company will lease the building which is approximately 3500 square feet, and includes a sales floor at the front of the building. [COMPANY NAME] is committed to helping our customers and all community members conserve water with the latest technology and science available. We research available products and make recommendations based on real world use, maintenance and reliability. For 20 years our customers have trusted us to help guide them into the best products for their situations and we are still the ones to trust when looking for advice or information regarding conservation products and issues. [COMPANY NAME] is committed to helping our customers and all community members conserve water with the latest technology and science available. We are also committed to expand products and service offered to our customers, create a more balanced financial statement, to offer greater benefits to our employees and to create a better life personally. The main office is located in [CITY], [STATE]. where all of the accounting is managed, the facility is approximately 7700 square feet and sits 1.25 acres of land. The [CITY] warehouse is approximately 2800 square feet and sits on 1/3rd of an acre. Both locations are owned by [NAME] and are leased to [COMPANY NAME], Inc. The Company has been in business since 1989 serving as an irrigation distributor of many major manufacturers in our industry. We supply products to landscape contractors, cities, school districts, government agencies, landscape gardeners and homeowners. [COMPANY NAME] has to locations in [STATE].